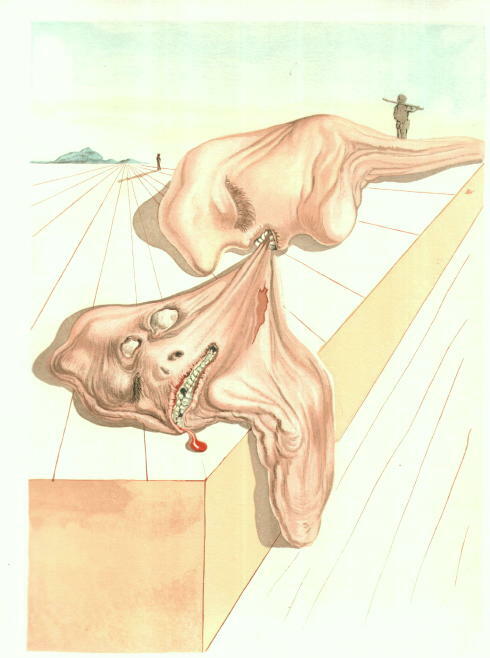 Of all the woodblock prints Salvador Dalí did to illustrate Dante's Divine Comedy, my favorite is "Schicchi's Bite." I finally got one, which I scanned before matting and framing. As you can see, it's not signed by Dalí, but if it was, it would have cost thousands of dollars. Even then, the man's signatures are problematic and with rare exceptions, it's impossible to have a 100% assurance that a Dalí signature is authentic. The unsigned prints are really just as nice, and they're surprisingly affordable. The fiercely competitive theme almost reminds me of the election. who gnaws the other in his raving." Gnaws the other in his raving? I guess you could say that about certain types of blogging.